Spencer Sawaske from Northern California had a pretty good day. 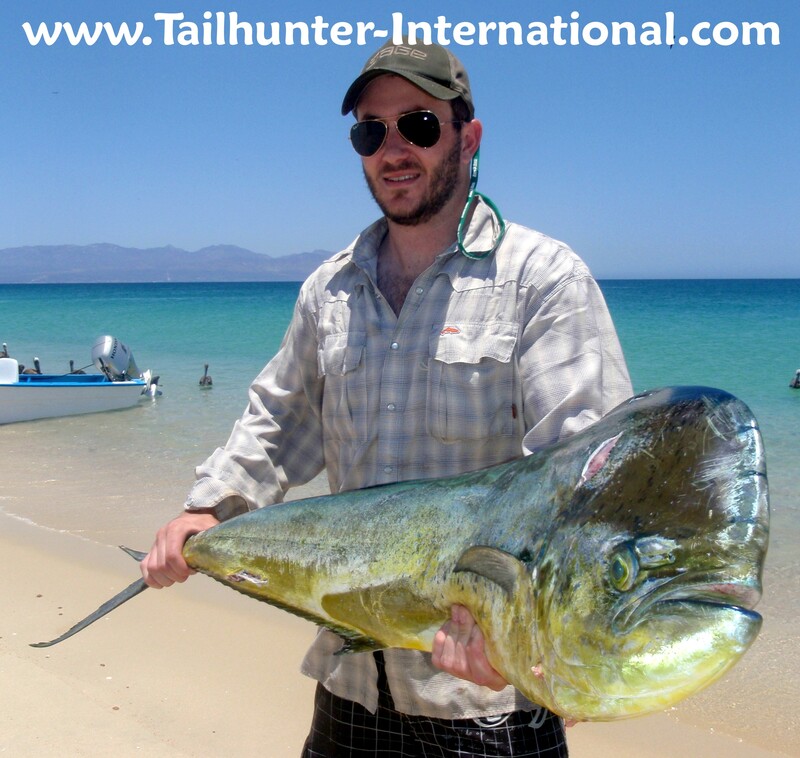 First, he released a marlin, then got this monster dorado fishing off Cerralvo Island on the south side and also near the Arenas lighthouse. 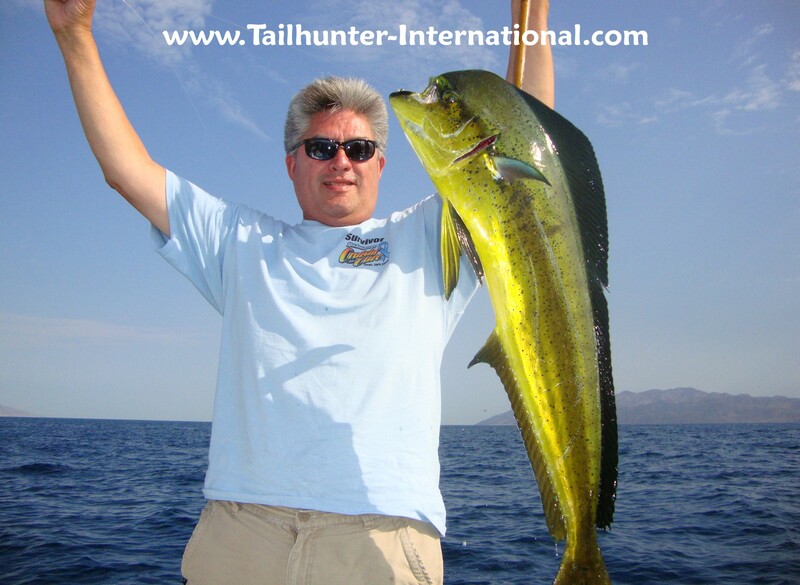 Better dorado and marlin fishing were the highlight during a full-moon week. 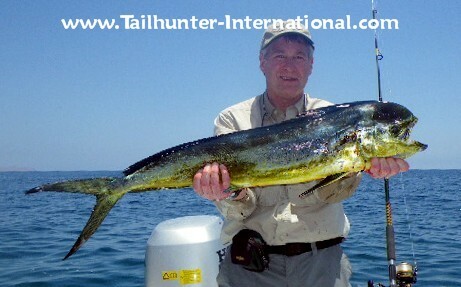 Retired NFL linebacker and football coach...and one of Tailhunter's best amigos, Donnie Rea, shows off one of the nicer dorado taken this week with our Tailhunter La Paz fleet north of La Paz. 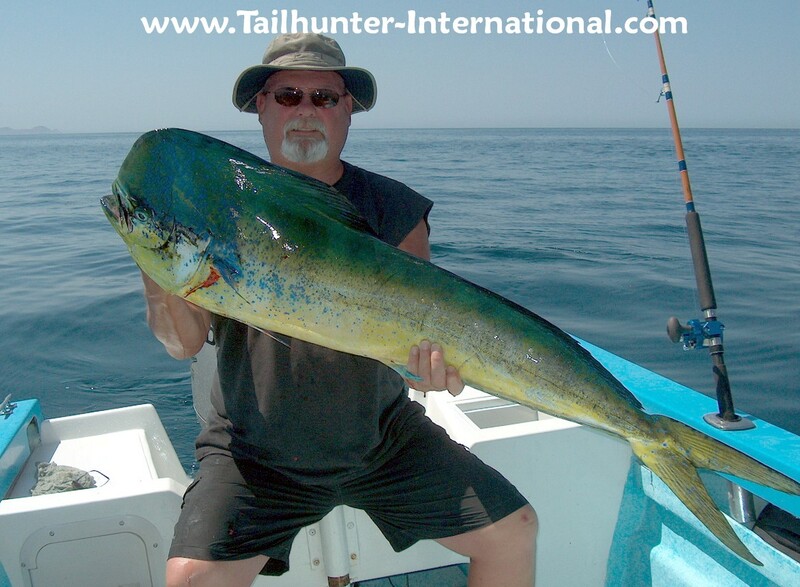 Although bait continued to be slow to find, most boats did some pretty decent dorado fishing. Coach Rea was fishing with Captain Marcos. Despite rapidly warming waters, pargo continue to be hungry and equally frustrating busting off lots of anglers. This one didn't get away. 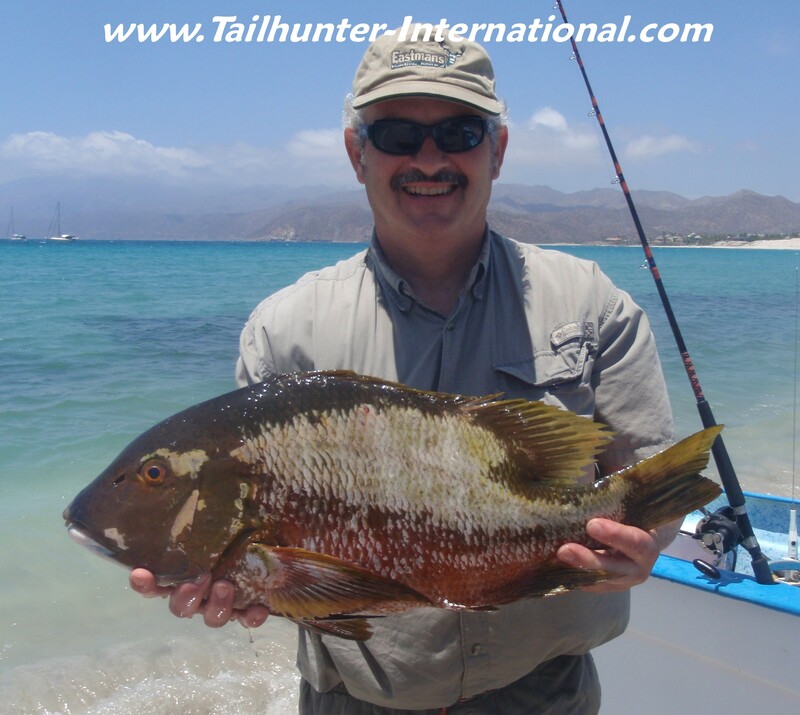 In fact, according to our amigo Dave Wehner who has been fishing with us 8 years, this big barred pargo came up and ate an entire slow trolled bonito Dave was using for bait! 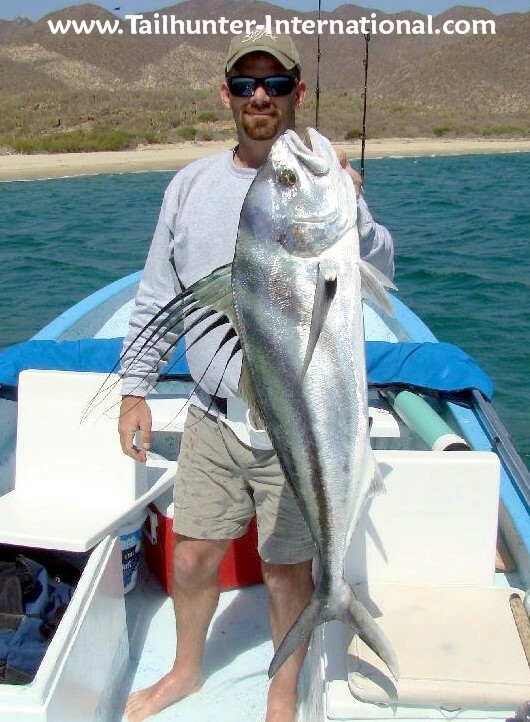 Later in the week, Dave nailed a 65 pound roosterfish on his itty-bitty bass rod that he fought for 90 minutes! His wife Mary then hooked up on a 150 pound blue marlin! Both fish were released! 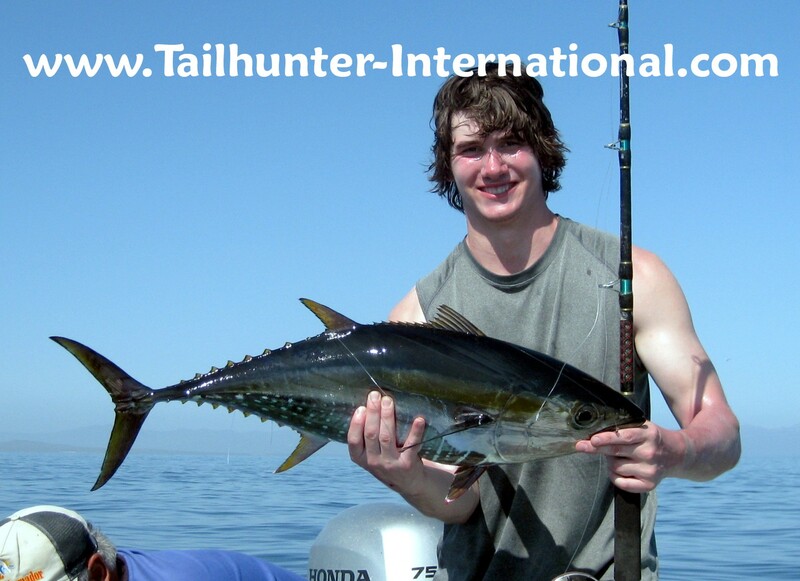 Some nice tuna poked their heads up this week...albeit too briefly. Just enough to tease everyone . It seems everytime we get a glimpse of giant squid coming up from the deep trenches, we got some tuna following them up! We actually had a few 100 pounders hooked and lost, but this was one 50-pounder that Garden Grove amigo, Jonathan Navarro, caught near the Las Arenas lighthouse fishing with Captain Victor. Retired firefighter Ed Basurto from Sacramento holds up one of the better bull dorado we got this week while fishing off Las Arenas near Cerralvo Island. 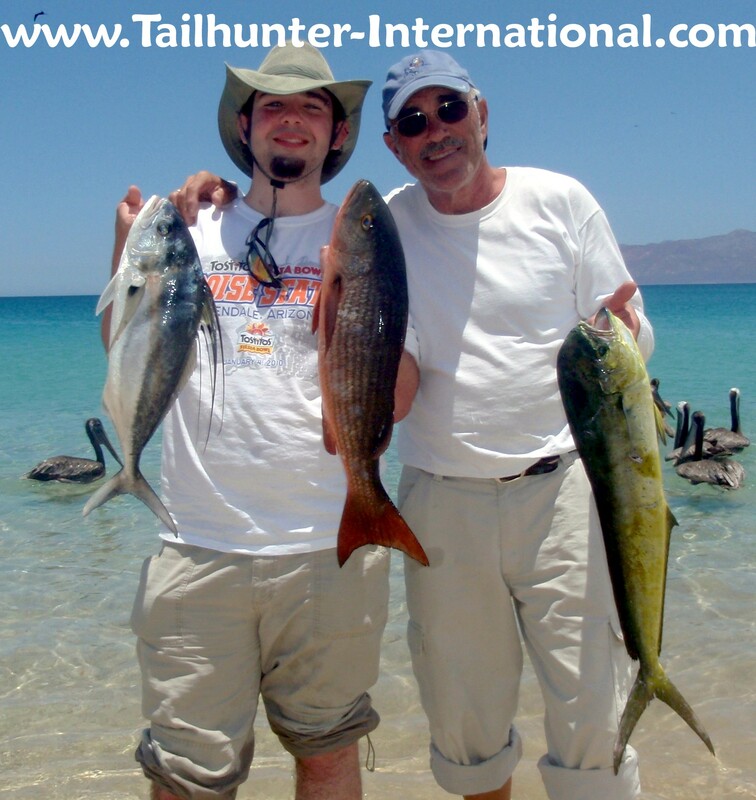 Rex Smith from Arizona and Fred Sontag from Arkansas and their other brothers Mike and John, had a nice day north of La Paz fishing with the Tailhunter La Paz Fleet. They released a marlin and sailfish. Captain Armando with our Tailhunter Las Arenas fleet helps pose a nice dorado for Dan who had never fished before but ended up with a handful as well as a marlin on his first outing. He outfished most of his buddies and said it was because he wore his lucky wristwatch. Grand slam for Mal Young and dad, Bob. It was a delayed high-school graduation present that Mal waited 2 years for, but it resulted in a striped marlin plus this trio that shows some of the variety...a roosterfish, a pargo liso and a dorado! It's summer, but we're still getting some colder water fish like this sierra held by Fred Sontag from Arkanasas. Fresh one! Rich Navarro hoists a summer-time bull dorado that bit a live sardine. SUMMERTIME CONDITIONS PROMPT DORADO AND MARLIN TO WAKE UP! Things are definitely changing here finally. Winds have laid down quite a bit. Waters and air temps are getting noticeably warmer too. It finally feels like summer. Waters are high 70’s to low 80’s Daytime temps are high 90’s to low 100’s, but there’s still a nice breeze most times. Our anglers are telling us it’s one of the most pleasant June’s they’ve ever experienced here. Co-incidentally, fishing has seemingly turned the corner as well. While not wide open, the warmer conditions finally brought in more of the top-water species. 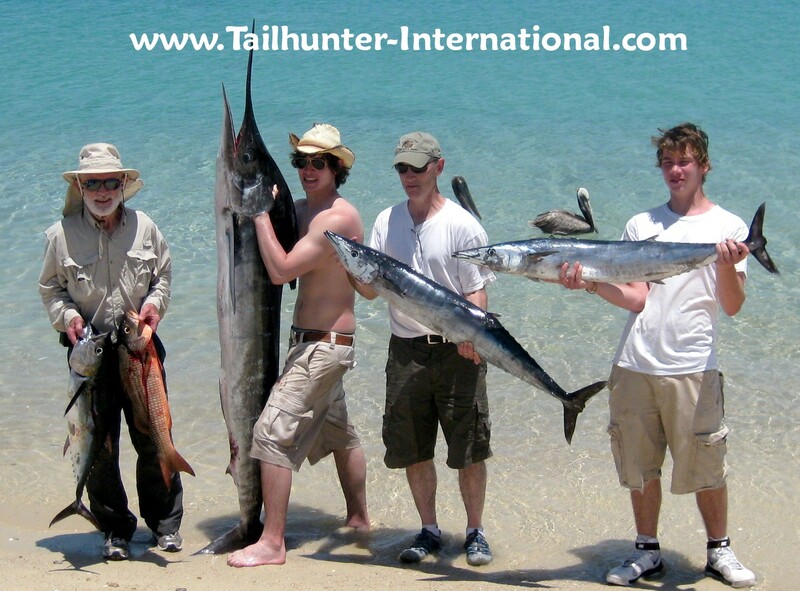 For sure, it finally kick-started all the marlin and sailfish that have been lazing around our waters for two months. 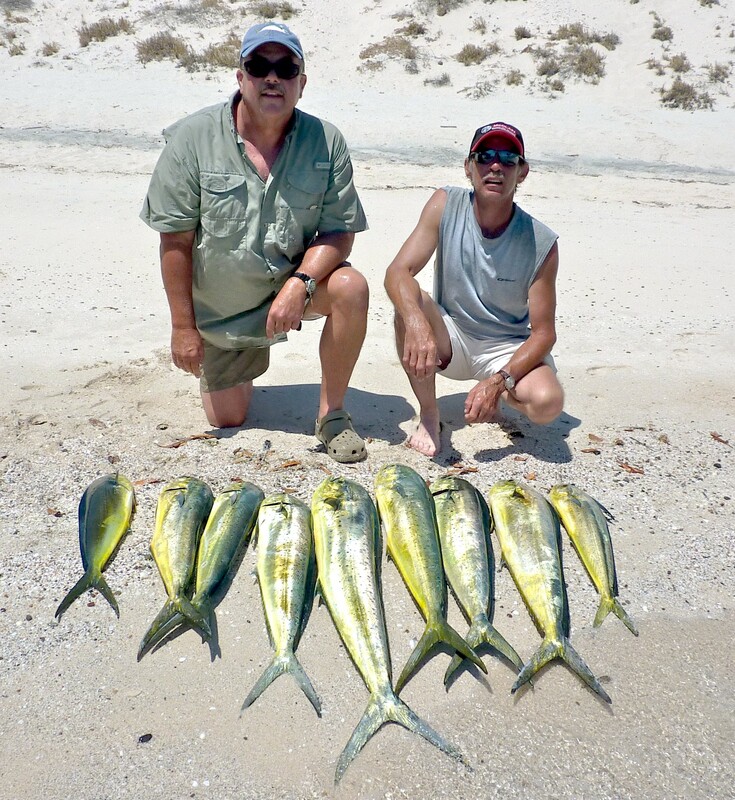 “We had 8 swimming around our panga at one time!” said one of our anglers. It was not unusual to hook 1 or 2 this week. Many fish broke- off on the lighter tackle, but it’s gratifying to see so many anglers…especially first timers…releasing their billfish! Bravo! 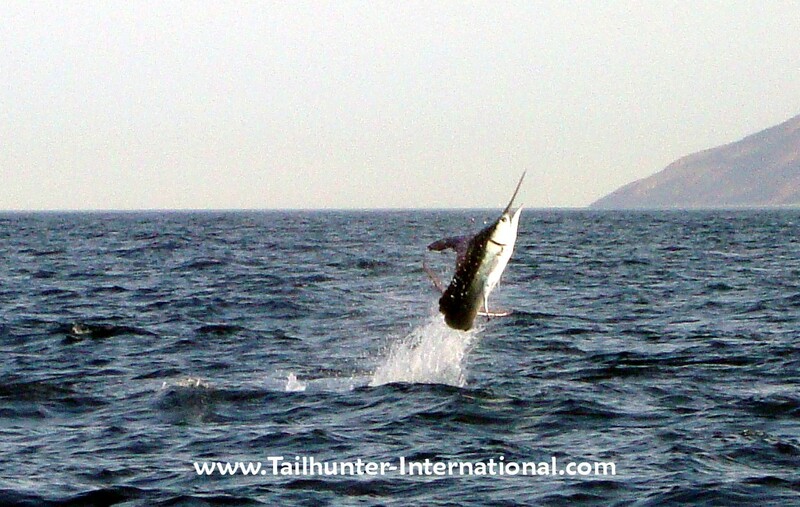 Our Tailhunter Las Arenas Fleet has been seeing most of the billfish action. As well, there’s been a smattering of tuna in the 60-100 pound class as it seems the big Humboldt squid have come up to the surface from their trenches and that usually brings the big tuna with them. 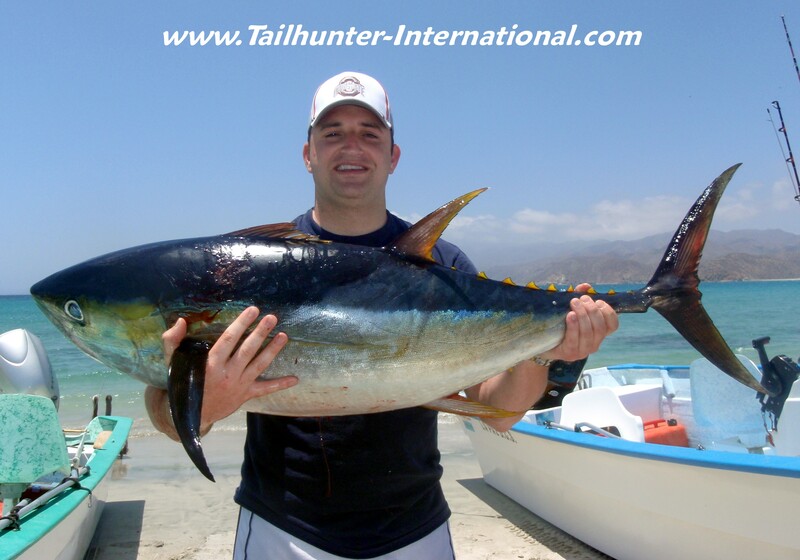 There weren’t many tuna, but here and there, they popped up and tore into a few of our pangas leaving anglers battered and bruised and, more often than not, with nothing to show after long battles where the fish broke off or got unbuttoned. Also, we’re seeing many more dorado all around La Paz waters, but even moreso, we’re finally seeing bigger 20-40 pound bulls instead of the little punks we’ve been dealing with since April. Every day several fish in the 25-30 pound class have been taken at various spots. Check out the photos this week! Lots of dorado shots! Bait is the biggest issue. We’re getting bait, but it just takes time to find it or wait for the bait guys to find it so they can sell it to us. Once you have the bait, the fish can be found. The fish are here…no doubt. Hopefully, that will change but we’ll keep an eye out for it. We’ve been using mostly sardines, but a few cocineros and even some big squid has been working or stripped out bonito for slow trolling the larger dorado. Thanks to Mike Sontag from Arizona for putting this one together! 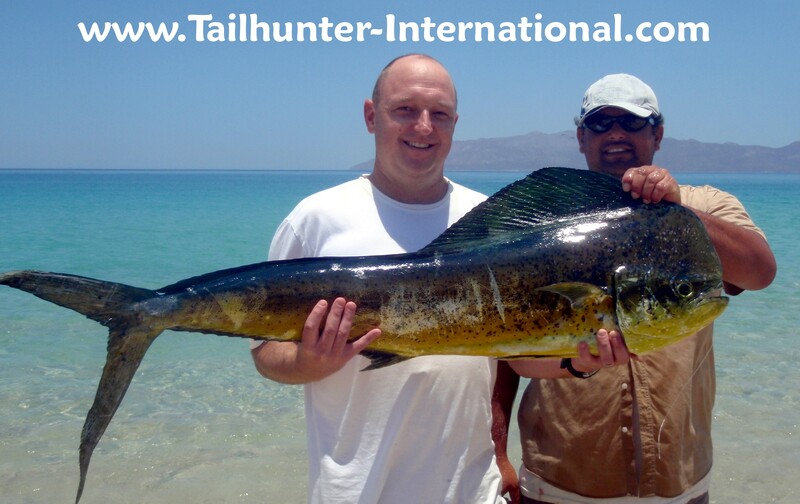 “The fishing the week of June 25th was phenomenal. Besides having my fishing partner extraordinaire (Rex) with us, I was blessed with being able to spend quality time with my 2 brothers (both from the midwest). The first 2 days launched out of Los Arenas with my brother tying into a beautiful marlin within an hour of being on the water. The fight was on with the fish showing us his size and attitude with a series of surface crashing launches and acrobatics. The fish won out after a 10 minute fight, but not without leaving a lifetime impression on my brother and me since I was able to watch the silly smirk on my brothers face for the durations of the hookup (I believe it s permanent as it still hasn’t left his face). Not to be outdone, within another 30 minutes I had a sailfish on the business end of the rod while my brother provided commentary and helpful hints since he was now experienced at this sort of thing. The sail was a thing of beauty and after about 25 minutes was brought up next to the boat. Our masterful Captain Ramiro estimated it’s weight at about 40-45 Kg (90-100lbs). We performed CPR (catch, photograph, release) and let it go for another day. The rest of our day as well as the same for Rex and my other brother was rounded out with a multi-species bad of pargo, trigger, sierra, dorado, amberjack, bonita, plus several roosterfish sightings. Family Outing with three generations of the Whittlesey guys including grandpa Norman (tuna and pargo); grandson Mike (striped marlin); Dad Craig (wahoo) and grandson Dan with another wahoo. The guys from Pullman Washington spent the past week fishing with us and had this great day fishing with our Tailhunter Las Arenas fleet. The bite reflected the improved fishing towards the end of the week. Ed Johnson from S.California got into the nice jag of Cerralvo Island on the south side that went off this past week. It was his first trip and his panga got 3 wahoo and lost another. They also got dorado. The wahoo were eating trolled deep running dark colored lures early in the morning. Making his first trip to La Paz from Colorado, Jim Schmid had an eventful week with all the different species he encountered (see account below) including this La Paz dorado as more dorado moved into the area with some larger fish like Jim's. Leif Dover from Atlanta GA spent a week with us targeting "only big fish" and spending the time to only use larger baits and fishing larger tackle. 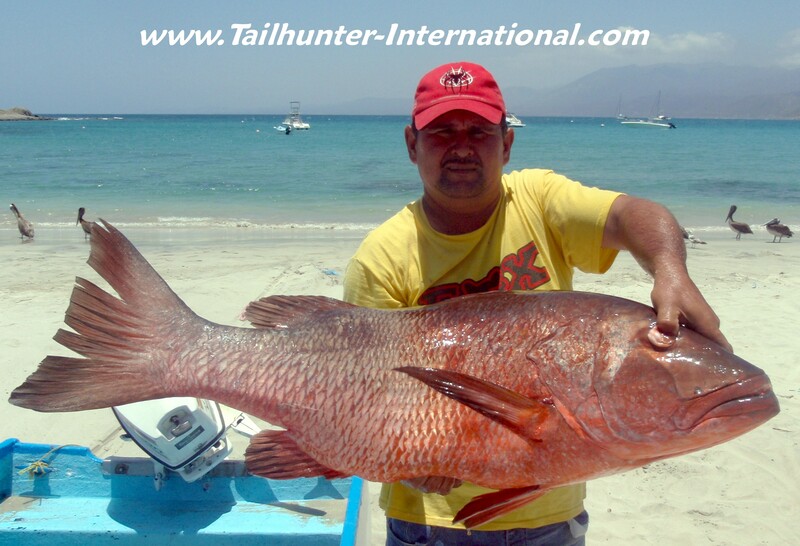 It paid off with this beast dog-tooth cubera snapper with Captain Adolfo looking on. Big roosterfish are still around in what has turned out to be an excellent roosterfish season. Check out Scott Damron's big fish he caught and released south of Muertos Bay. Not a bad day at all. 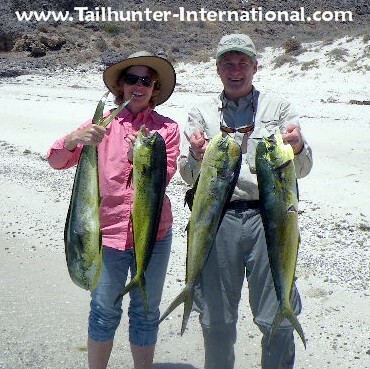 Early the week, the dorado bite was tough as winds pushed things around, but Cindi and Jim Schmid from Colorado still managed 4 nice mahi. As the week went on, winds diminished and dorado got more cooperative. It's not big...but it's big news and a great catch, especially for a first timer like Mike Whittlesey from Washington who got this tuna near Cerralvo Island trolling for wahoo. Tuna keep popping up, but not staying so we have to keep an eye on this! 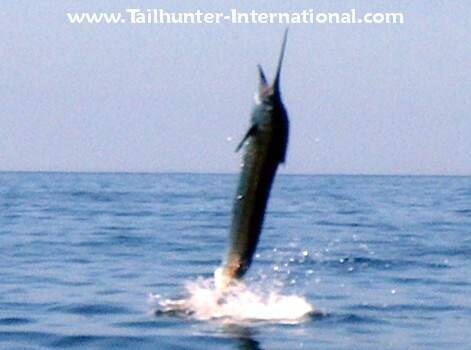 Captured in mid-flight during the battle, Jim Schmid's sailfish goes vertical. The fish broke off at the boat after a long fight and was "the fish of a lifetime" according to Jim. 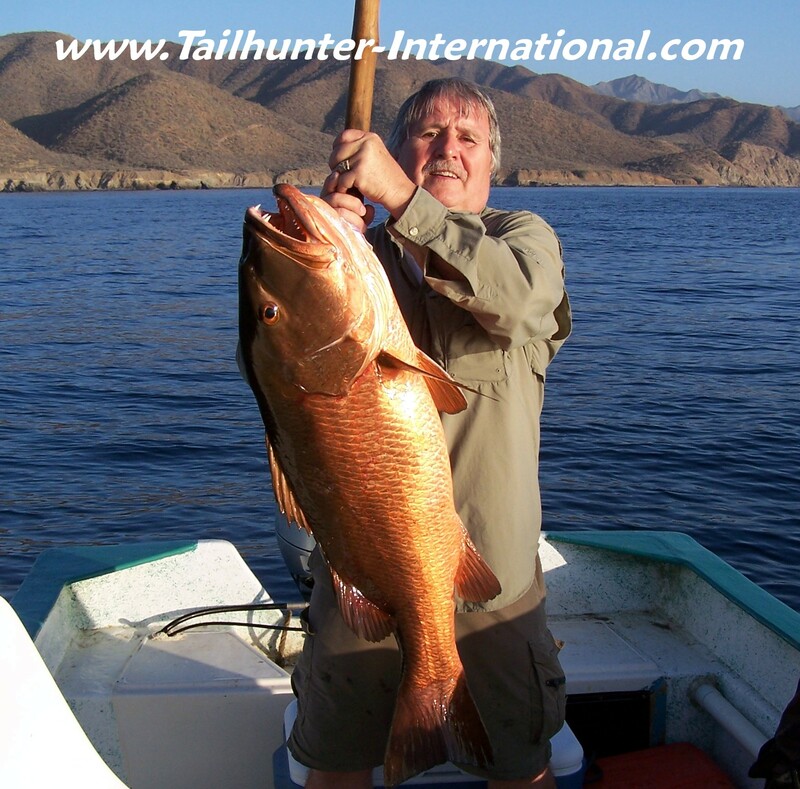 They were fishing north of La Paz with Captain Raul and our Tailhunter La Paz Fleet. SLOW START OF THE WEEK ENDS IN HIGHER NOTES BY THE END! The week started slow and scratchy with some really tough fishing. Winds again kept blowing erratically not only turning waters off-color, but also scattering bait and generally putting lock-jaw on the fishing. There were times early-on when even the bonito seemed dis-interested in biting and basically, we all struggled with both our Las Arenas and our La Paz fleet. How bad? 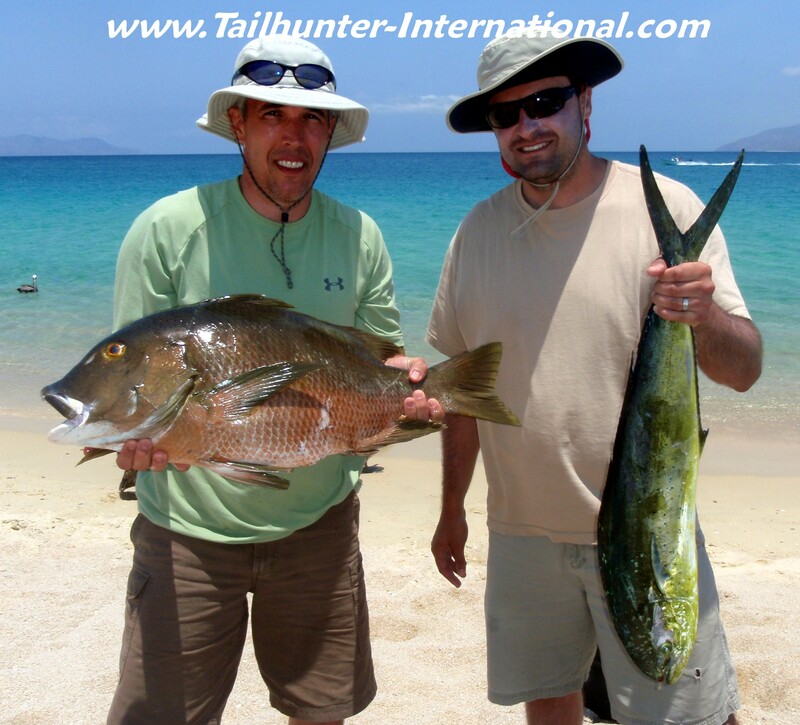 Well, imagine getting excited about BIG triggerfish! Well…not quite that bad, but we sure had to work hard for the roosters, pargo, cabrilla and inshore fish that we got. 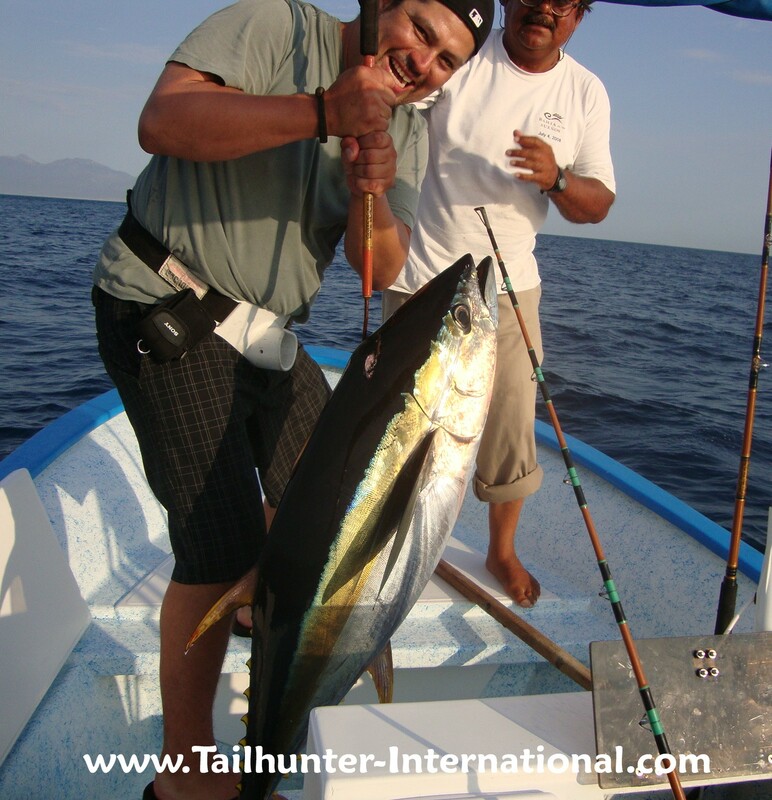 We suddenly found dorado, wahoo, some marlin and sailfish…even some tuna bit! What a difference a day or two makes! Roosterfish kept coming on. Dorado up to 30 pounds. Every day there were a few billfish hooked (lost or released). For a few days, it seemed every boat fishing south of Cerralvo Island hooked a wahoo…not necessarily put it in the boat, but they were getting bit and several boats each day did put a wahoo in the pangas. As of the time I’m writing this, winds have stayed relatively calm and the waters are getting clearer. Our biggest challenge is the live bait now. The winds have beat up the bait so badly over the last few months and thrashing all the usual bait spots that the bait is scattered and takes a long time to get. For our La Paz fleet, they’re doing OK, but it’s taking almost 2-3 hours to find enough bait or waiting for the bait guys to catch enough to sell. Once they get the bait, it’s fine. For our Las Arenas fleet, as has been the case for about 3 months, the bait is all the way up the east side of Cerralvo Island. Rather than spend the time going all the way up then coming all the way back, our captains are using the time to troll around the south end of the island for wahoo and waiting for the bait guys to come back from getting bait and then buying it. Alot of the anglers can’t understand why it takes so long or why we don’t do something else. You gotta understand, it’s pretty hard to fish without bait unless you want to troll around all day. It’s not like we can wave a magic wand and make bait suddenly appear or get easier to catch. The weird weather patterns have just made this a tougher season so far to get bait. Once you get the bait, there’s fish to be caught. It’s just trying everyone’s patience a bit more than normal. Thank you to Jim Schmid for this! 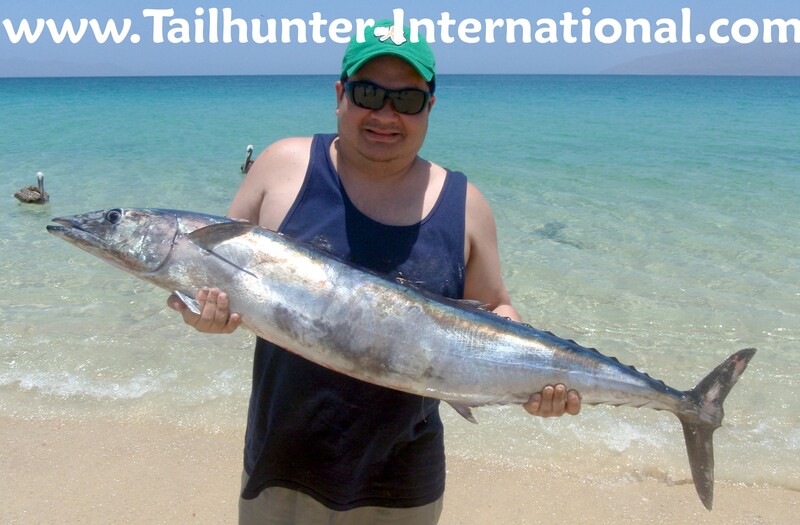 “While the fishing was a little tougher than we hoped for, in 4 days we managed to catch 9 different species, 61 fish total, brought home a cooler full of filets, and still had extra fish to give away to Captain Raul and some of the hotel staff. I really wanted at least one BIG TROPHY FISH, and my wish was fulfilled on the last hour of the last day, when we hooked a very large sailfish. I spotted the fish behind our boat, and Capt. Raul made two quick hand thrown casts to place the sardine in the path of the fish, which cooperated by eating it. Cindy graciously offered me the opportunity to fight the fish (hooked on her rod), and 40 minutes later, we brought it to boatside. Unfortunately, when Raul grabbed the 30 # line and tried to get ahold of the fish’s bill, it thrashed and the line snapped. We were going to release it, anyway, but it would have been nice to get some better photos (Cindy got a good one of it jumping, attached here) Oh well, we will always have the memory of that huge fish jumping out of the water, over and over…a total of TEN TIMES! Raul said it was a “Very big one” and estimated the weight at 70kg.! By the way, wherever you’re celebrating it, Happy Father’s Day everyone! God bless all the dads out there. 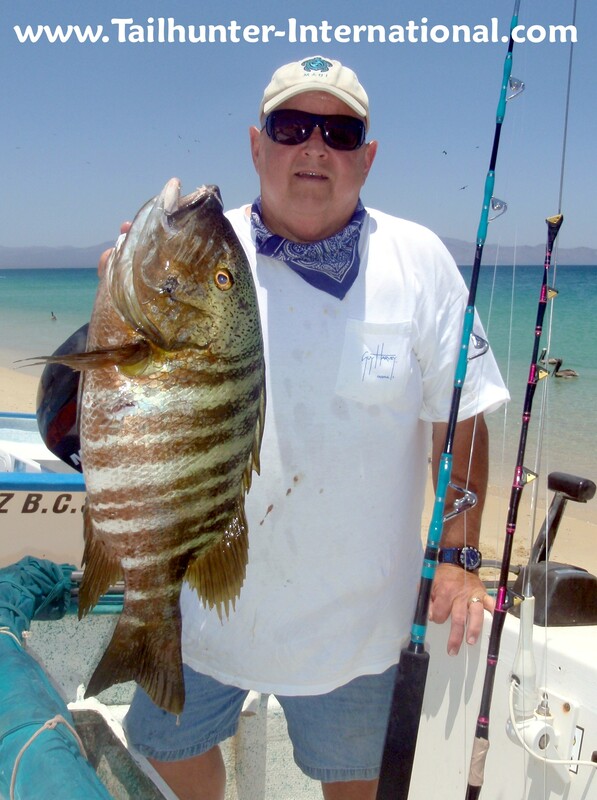 One of our bestest amigos, Doug Oclassen from Boulder, Colorado comes at least once or twice a year to La Paz for at least a decade to fish with us. 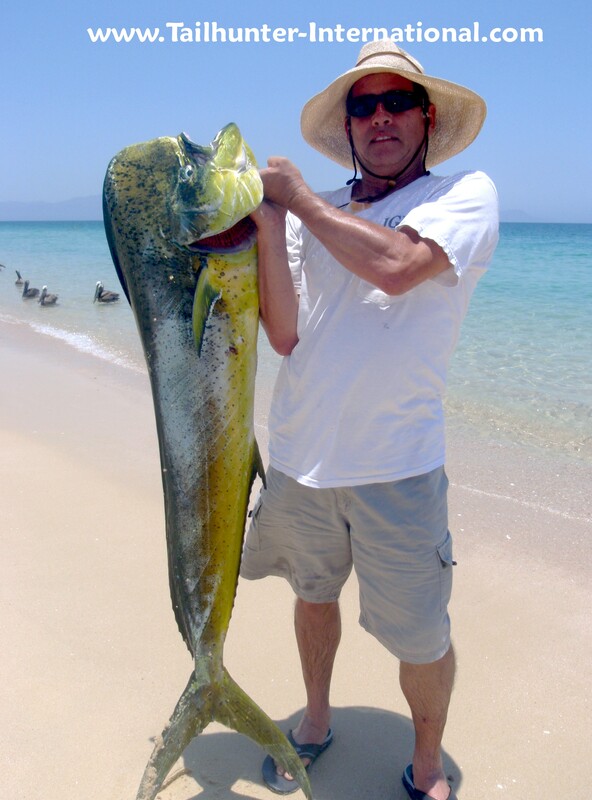 Even when it's flat calm, he gets really seasick, but never ever lets it stop him from fishing hard and often nailing the biggest fish on the beach like this 35-pound class dorado he got on live bait fishing off Las Arenas beach...our largest dorado of the week. 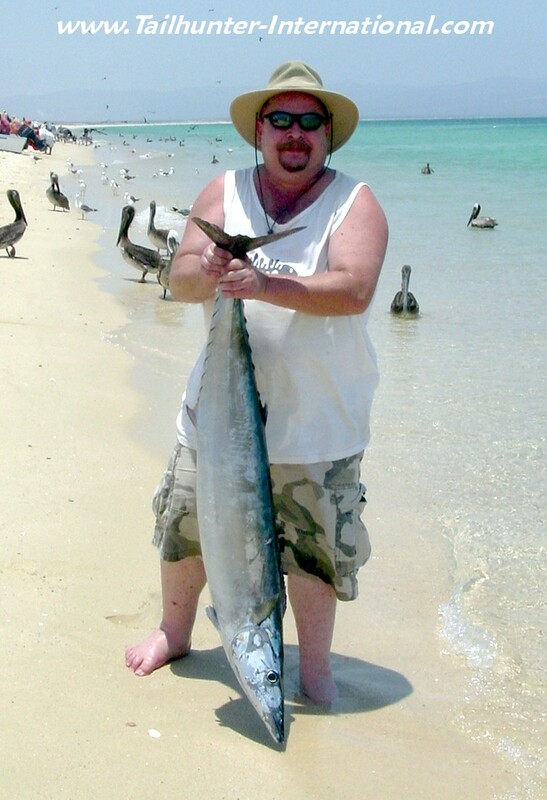 He kept this fish, but released all his other fish during the week including big roosterfish. 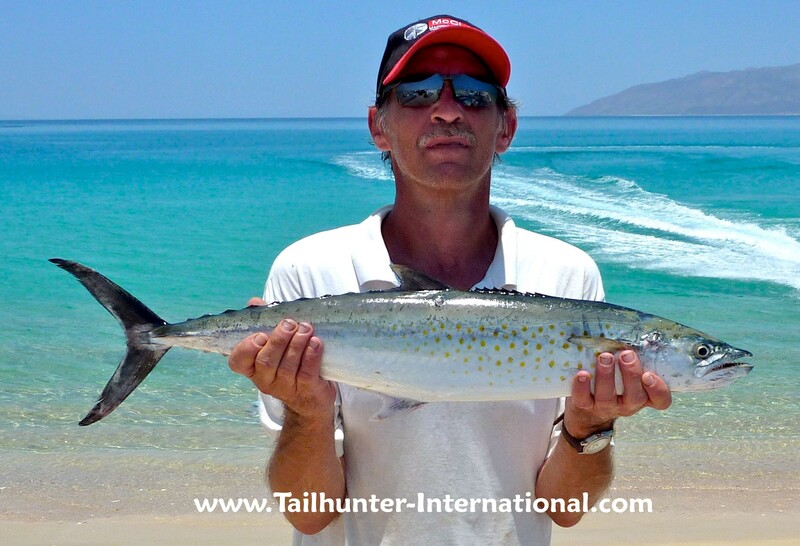 Russ Ing had to cancel twice before finally making it down to fish with us and within 30 minutes of putting his line into the water on his first day, nailed this choice wahoo fishing with our Tailhunter Las Arenas fleet. It's June and we still have such a crazy mix of fish because conditions are cooler than normal as shown by the dorado and barred pargo here. One is an inshore rock fish. The other is a bluewater migratory pelagic species! ANGLERS WORK HARD FOR THEIR FISH THIS WEEK AS WIND CONTINUES TO PESTER LOCAL WATERS! A sporadic scratchy week of fishing down here. It’s like we can’t get summer kick-started! Every time it starts to get warm, the winds come up again and cool things down and stir up the waters and the bait. In fact, it’s blown up some really green water down deep that’s turned the surface water off-color. It’s amazing but a day after the winds stop, it changes again and the fish come to eat. Then, the winds come up and the fish are all over, but just don’t want to eat. Don’t get me wrong. It’s beautiful to be in La Paz right now…not too hot. Not too cold. Great vacation weather. It’s just that out on the water the winds make it bumpy and it’s not the best deal for fishing. Still, we got a few nice fish here and there. For our La Paz fleet, the dorado continue to be the main target, but, depending on conditions, the boats slam the fish or struggle through a picky bite. One day differs from the next. Most of the fish have been coming in the channel between the peninsula and Cerralvo Island around Punta Coyote and Las Cruces. Live bait works best as well as strips of fresh bonito for the larger fish, but what we’d really like to see are patches of sargasso weed which are great fish attractants. The problem is that when the winds blow, it blows all the weed patched apart. 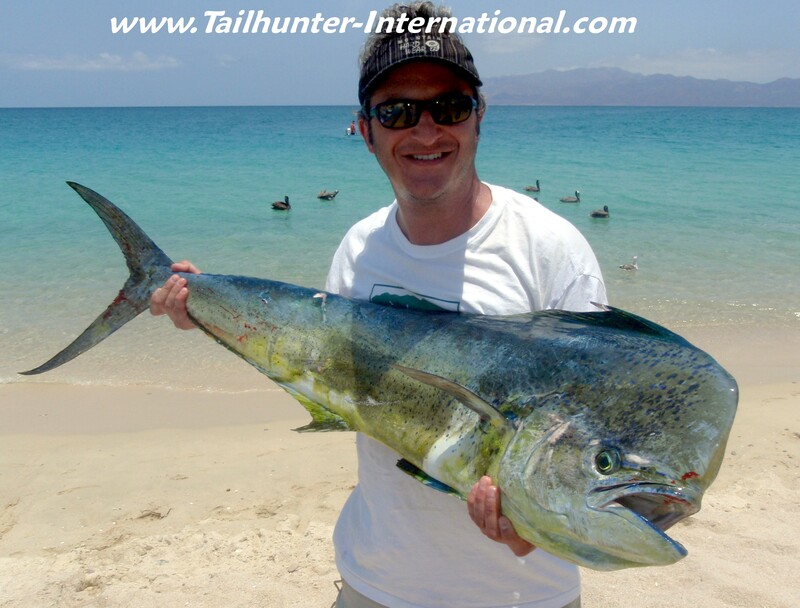 When it all clumps up, it not only offers great protection to bait fish which get the dorado going, but the flying fish also lay their eggs in them and dorado love flying fish and the young. We did finally get a few billfish at the end of the week that we’ll have to keep an eye on. We hooked some sailfish and marlin that were all released and one tuna as well that came out’ve the blue and even one yellowtail…go figure. But no trends to speak of quite yet. We’ll keep you posted. For our Las Arenas fleet, we’ve finally moved all the boats over from Bahia de Los Muertos to the beach by the lighthouse. Again, because of the winds, most of the fishing has been around the island or inshore for roosterfish between 10 and 40 pounds; pompano, jack crevalle, porgy and lots of bonito. Over the rocks and reefs, the cooler waters are still keeping the big pargo close to shore with most big ones being lost in the rocks. There have been some dorado taken and some marlin here and there, but most still don’t want to eat. 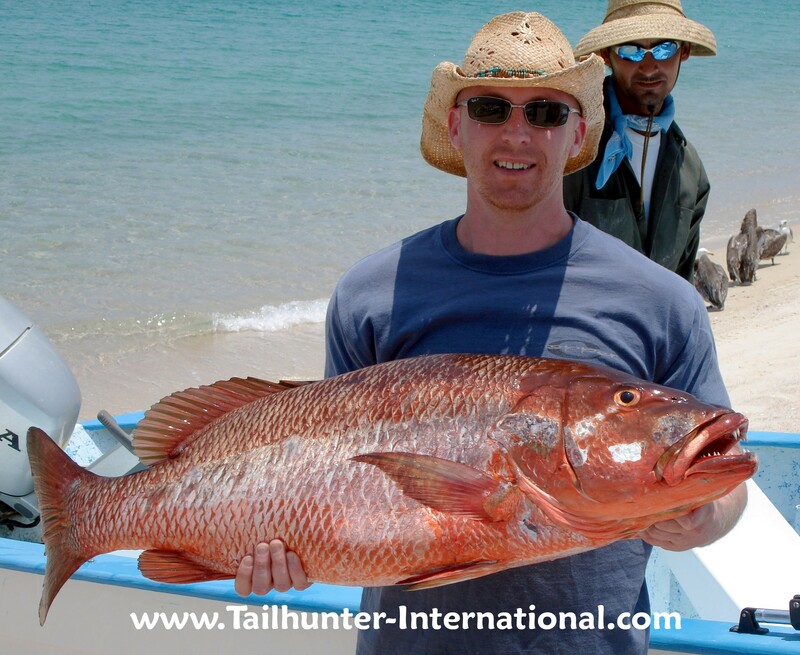 Our buddy, Don White, proudly holds up a personal best dog-tooth-snapper (cubera snapper or pargo perro) just offshore while fishing with Captain Pancho. That's Cerralvo Island in the background and Don, who came down from Oregon and spent the better part of two weeks with us, got the big dog using a live sardine. 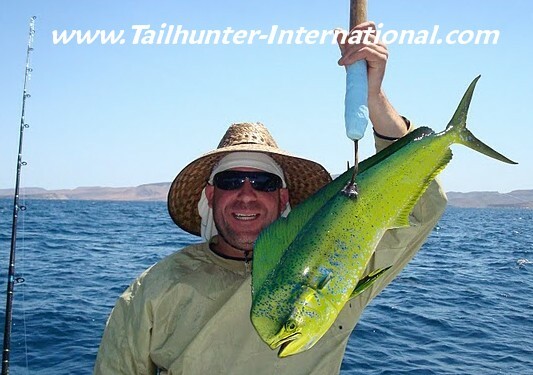 Given it's already June, dorado were a little harder to come by especially earlier in the week, but Chris Spagnoli from northern California holds up one of several he took while fishing with our Tailhunter La Paz fleet north of town around Las Cruces. Debbie White swore she would only fish one day and ended up with 3 days on the water and almost outfished her husband Don each day. 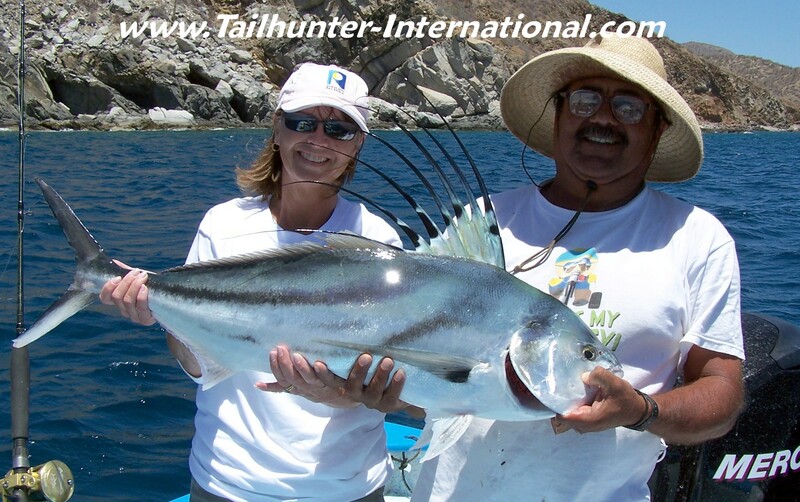 She's shown here in a great photo with Captain Victor and her prized roosterfish just inside of Muertos Bay before releasing it. 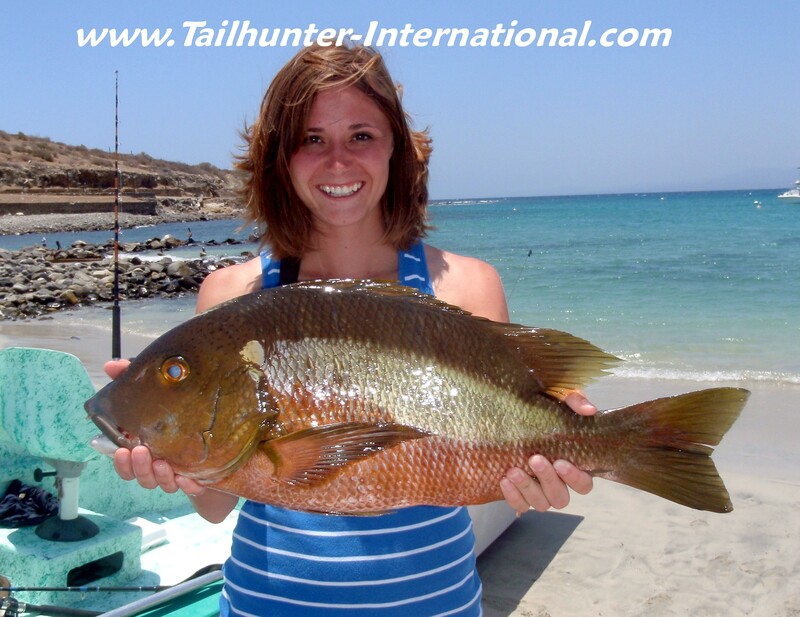 Kristiana Frustacia from Utah says she's coming back soon after her first trip to La Paz and is all smiled holding this nice barred pargo caught fishing with our Tailhunter Las Arenas Fleet. Captain Adolfo looks over the shoulder of Phil Catlin from Idianapolis, Indiana holding up one of the larger female dorado we've taken recently with Cerralvo Island in the background. A spur-of-the-moment trip for Phil Pfifer and his wife, Gail, paid off in some nice fishing for these first timers from Utah. Our amigos were more used to cactching planted trout but had a blast with some nice varieties of pargo and reef fish and "about 40 bonito" according to Captain Armando that left them with tired arms and big grins! For those who don't believe it's possible to pull a really monster dog-tooth out of the rocks, here's proof. If you've ever battled pargo, you know how frustrating it can be to get even a smaller fish out even though the fish are in shallow water. Well, here's a monster although in all honesty, it was taken on a handline by a commercial captain, but the picture was too cool to pass up. It wasn’t the greatest week for fishing. It wasn’t bad, but given it’s already June, conditions were less than stellar. Folks caught fish, but it was more like fishing in late April or early May as erratic winds persisted on-and-off throughout the week changing the water temperatures; moving the bait around; and changing the bite. Not to mention that there were a ton of boats out all week fishing both Las Arenas and La Paz areas due to several local tournaments and just alot of anglers in town. But, there were still some very good catches! 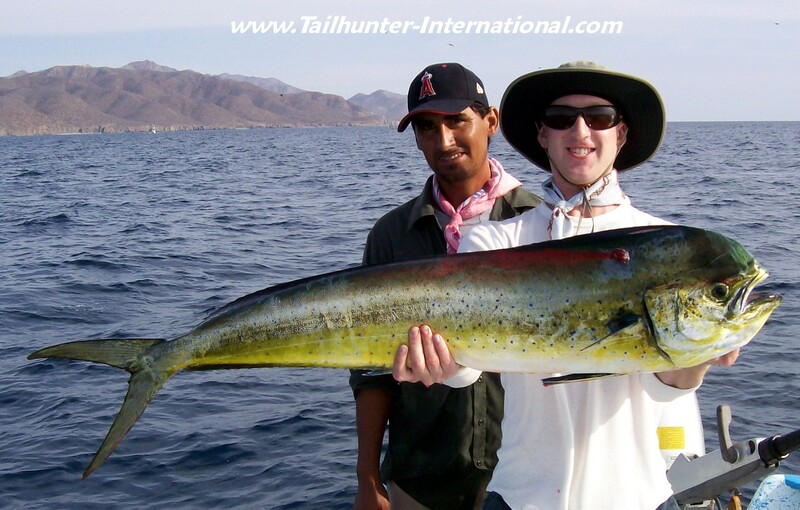 The winds put a damper on the dorado fishing for our Tailhunter La Paz Fleet. Boats averaged about 4-6 dorado each and most were in the smaller 5-10 pound category…really small for the time of year. However, captains told me that the recent onslaught of winds made it not only choppy out there, but the bait got harder to find and some of the waters got cooler green. Still, picking around here and there, at the end of the day, most had at least a few fillets for the bucket. Occasionally, a boat would get into the wild school and go nuts, but this past week it was fewer and far between. We’ll have to see what happens to this wind. For us down here, it seems to be a reflection of what’s going on up the western coast of the U.S. which is still getting some really wacky cool and cold weather. It seems that whenever that happens we get the winds. In town, it’s as awesome as can be. Perfect 85 degree beach weather and perfect for kicking-back on the sand or in some little cafe with chips and salsa and a cold one. But for fishing, it’s just not as good as we should be seeing. Our Las Arenas fleet did much better. There weren’t many blue water species to speak of, but we did hit a little spot of good-grade tuna off Cerralvo Island of 25-50 pound fish. It was brief but exciting. Teasers really. No idea if this will be a consistent bite. However, inshore, the roosterfish continue to be stars. Although not good eating, nothing is quite as fun as these jacks with the funny fin ripping into the baits! Fish from 10-60 pounds give anglers quite a range of possibilities when they’re working the beaches and the exotic species is quite a prize for any angler. Our flyfishers and light tackle anglers are especially having fun. Also, the big pargo continue to bite, tease and frustrate. With the waters staying cooler than normal, the big red fish are hanging close to shore and guys will tell you of multiple bites that they just can’t stop. We did get a few in the 25-40 pound class that anyone will tell you are trophies, but larger fish just can’t seem to be stopped! Check out some of the photos this week and imagine stopping some of these fish in only a few feet of water before the get into the rocks. Hopefully, the winds slow down soon!